This landmark four-day event welcomed all new features and exhibits and a vibrant line-up of the finest in gardening, food and lifestyle. Headline guest was Alan Titchmarsh, along with fellow gardening experts Carol Klein, Monty Don, Joe Swift and Adam Frost. See which celebrities were at the show. The Floral Marquee welcomed 69 leading UK nurseries, with impressive displays of prized blooms and new varieties. Take a look at the exciting highlights that you could browse. A highly anticipated feature, BBC Gardeners’ World presenter and designer, Joe Swift brought the Plant Finder Parlour to the Floral Marquee. There were daily talks from award-winning nurseries and a welcome for budding gardeners big and small. Jekka McVicar has designed and built a specially commissioned permanent garden, bringing to life the role gardens continue to play in our health and wellbeing. Jekka’s feel-good garden is a living working space for mind, body and senses. The highest standard of garden design was showcased in the Show Gardens of RHS Malvern Spring Festival 2017. Leading designers created awe-inspiring gardens as they competed for prestigious RHS accolades including Gold medals and the coveted Best In Show. 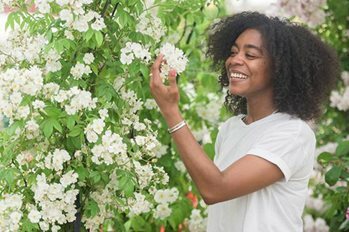 A brand new category introduced for the very first time to the show, offering a unique platform for emerging gardening talent. The Spa Gardens category also featured one garden from an international designer supported by Moscow Flower Show, part of a newly introduced exchange programme. These gardens are designed and built entirely by young people. This year saw 13 schools and educational groups from across the three counties taking part, led by BBC Blue Peter Gardener, Chris Collins. Exploration Zone - Here were the ever-popular School Gardens, which this year were all themed around Space. You could be transported to space as you stepped into the Planetarium with daily talks including Great Plant Adventures, Back to Moon and We Are Aliens. BBC Blue Peter Gardener, Chris Collins was on hand to guide young gardeners through planting workshops. Family Weekend, Saturday 13 and Sunday 14 May - This was the ideal opportunity to engage children in the fun of gardening and the great outdoors. They loved the Exploration Zone’s Planetarium, plus there was plenty more to keep them entertained with the marvellous Mr Alexanders vintage variety show and workshops from Chris Collins. Malvern Spring Festival had much more to offer alongside the fabulous plant displays and gardens. Botanic Art: combining artistic talent with the accurate scientific depiction of plants, this year’s festival welcomed three new exhibitors – Carol Hardie, the Irish Society of Botanical Artists, and Lynne Buckler. Returning to exhibit were Jacqui Gilleland and Bernard F Carter, with Nilavan Adams, Lynne Buckler and Lesley Randall. The 2017 show was bigger and better than ever before. Read all about it.